Greetings from Ukraine! thats great that Soviet cameras and optics are known worldwide! I have Zenit and Fed, I`ve bought them recently. It`s like a magic! I do not know, what was their history, they are older than me, and I treat them with great respect and love them! your site is very useful and convenient, thank you! Very nice website. Useful information, nicely collected and well organised. I really enjoy reading it. Добрый вечер, Aидас. Сегодня был на эксукурсии на заводе Ломо, и Лазарь Семенович показал Ваш сайт. В моей коллекции есть Смена-35 белого цвета. Если нужна, то отправлю фото для размещения на сайте. Пишете мне на почту. Отличный сайт. Amazing site!! I bought a red FED-2 camera and just found out it is a July/1957 camera!! Great website and awesome camera!!! Congrats!!! These cameras are beautiful, I admire your collection. In my country, soviet cams are not readily available. I travel around and collect them. You motivate me to collect more! Haha!! This site has been an invaluable tool, for me to to identify my collection properly. I started with Bronica's and then was attracted to a Zorki 4K, after the Zorki, I have started down the slippery slope of mad eBay purchases (my wife's words not mine) and have a fast growing collection. I even have a Fake Leica, which is almost certainly a Zorki(1), I determined this from this site alone. Thanks for all of your work on this, I check it at least once a week now, and will continue to do so. Ótimo site! Excelente trabalho. Parabéns! Excellent site, thank you. I have some Soviet cams and lenses, all very good. Juan Felipe Gómez. I still use my Zenit EM on occasion (still got a bit of B&W film to use up). Bought new from Dixons in Huddersfield UK around 1981 or 1982 with money from my Saturday job. Only my Canon digital SLR lasts as long! Really a nice site. Rich of information and images. 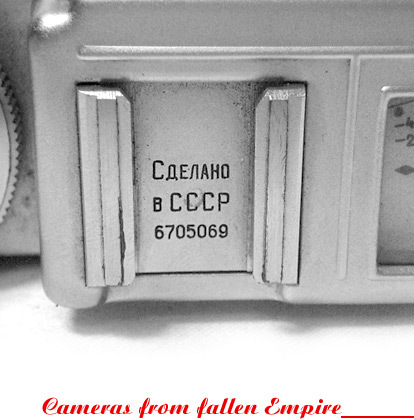 I also collect and use Soviet cameras, SLRs and rangefinders. Hi there, I'm new in collecting soviet cameras. I've already had one, which is Zorki-4. Thank you for this website that you have made, this has become one of my main reference. Great site. picked up a zenit ttl olympic edition last weekend at the market for a few dollars, leather case intace. it was awesome to be able to locate it and learn about it on what will become my favourite site on the net in coming years as I accumulate cameras! Thanks for a good selection of a material. Thanks for the qualitative information.